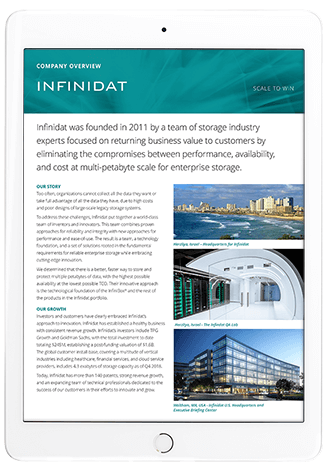 Infinidat was founded in 2011 by a team of storage industry experts focused on returning business value to customers by eliminating the compromises between performance, availability, and cost, at multi-petabyte scale for enterprise storage. The Infinidat team, spanning generations of storage industry experience and previous product successes, has become an industry leader by developing a better, faster way to store and protect multiple petabytes of data, with the highest possible availability, at the lowest possible cost. All of this work was done with a single goal in mind – enable customers to spend less on their infrastructure and focus more on innovation, growth, and competitive advantage. Investors and customers have clearly embraced Infinidat’s approach to innovation. With corporate headquarters in Herzliya, Israel, and U.S. headquarters in Waltham, Massachusetts, Infinidat has established a healthy business with consistent revenue growth. Infinidat’s investors include TPG Growth and Goldman Sachs, with the total investment to date totaling $325M, establishing a post-funding valuation of $1.6B. The global customer install base, covering a multitude of vertical industries including healthcare, financial services, and cloud service providers, is comprised of 4.3 exabytes of storage capacity as of Q4 2018. Today, Infinidat has more than 140 patents, strong revenue growth, and an expanding team of technical professionals dedicated to the success of our customers in their efforts to innovate and grow.